CHILDREN'S ILLUSTRATION: "What's outside your window?" No one has a better ear for rhyme than Linda Ashman. 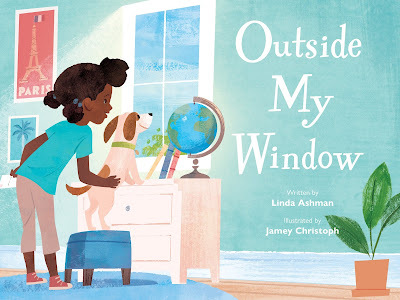 Outside My Window is a rhyming trip around the world, with every spread dedicated to a different home in a different geographical location. The sunny, graphic style has an optimism reminiscent of Mary Blair's Small World, Come Over To My House, pictures by Richard Erdoes, and Home, by Carson Ellis. The trip bounces to twelve different places including Copenhagen, a rural village in Ethiopia, Kyoto, the Rocky Mountains of Canada, Marrakesh, Boston, and back to the young suburban girl who first asks the question, "What's outside your window?" It's a reassuring poem and cozy introduction to other cultures. The book ends with bedtime. The girl looks at the moon "we share, that shines in windows everywhere."